A device that made use of a relationship between electron spin, electromagnetism and gravity allowed any object to leave the Earth's surface. 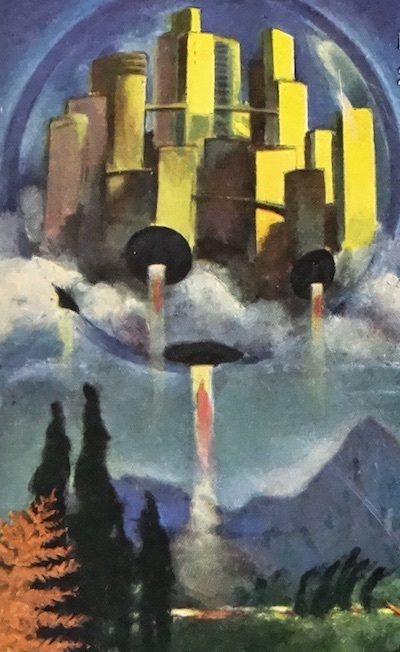 Cities in Flight is a classic set of novels, collected into one book. In the first and second novel, two key technologies are developed - drug therapies that bestowed long life and the spindizzy, which would shield an indeterminately large mass against gravity. The spindizzy was described as the result of the "Blackett-Dirac" equations. There was no longer any reason why a man-carrying vehicle to cross space needed to be small, cramped and penurious of weight. Once antigravity was an engineering reality, if was no longer necessary to design ships specially for space travel, for neither mass nor aerodynamic lines meant anything any more. The most massive and awkward object could be lifted and hurled off the Earth and carried almost any distance. Whole cities, if necessary, could be moved. New York, NY and Scranton, PA - see them while you still can. Note: the spindizzy is also known as the "Dillon-Wagoner gravitron polarity generator." Paul Dirac was, of course, a real person; he made many contributions to the theory of quantum mechanics, and won the Nobel prize for physics in 1933. Blackett was a real person, a British astronomer who noticed a correlation between the following parameters of astronomical objects: the rotation rates, the gravitational fields, and the magnetic fields. He went on to describe this relationship in papers published in scientific journals like Nature. However, improved measurements of the magnetic fields of the planets in the solar system did not fit the equation. The equation also does not demonstrate how the magnetic field of the Earth undergoes periodic reversals. At present, the magnetic field of the Earth is attributed to the movement of the Earth's core. Blish did not originate the term "spindizzy", but cleverly appropriated it. In the 1930s, it was the slang term for the model racing cars tethered to a pole. - Artificial Gravity Generator Now Possible? - Emdrive Electromagnetic Drive For Chinese Space Ships?